Incredibly Realistic Silk Flowers & Gorgeous Christmas For More Than Sixty Years! 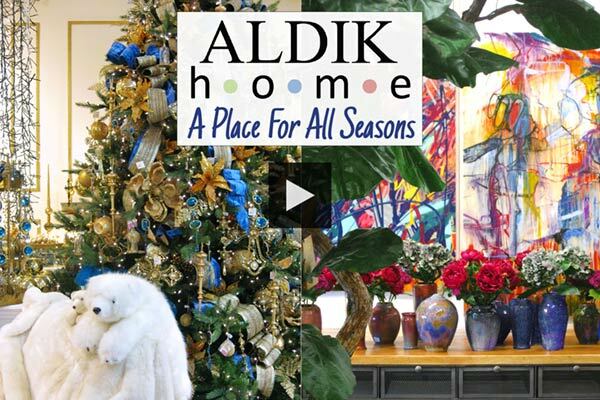 For more than 60 years, Aldik Home has provided home decor enthusiasts with high-quality silk flowers, silk foliage, floral arrangements, custom artificial trees, home decor, artificial Christmas trees and Holiday decor. "A beautiful floral arrangement or custom artificial tree can do more for a home's decor than even new furniture can, at a fraction of the cost"
When Richard Gold founded Aldik Artificial Flowers in 1951, he had a passion for offering the highest quality artificial flowers and foliage he could find. Through the years, as the product evolved from plastic to silk the company grew to be one of the largest importers in the industry. Once a part of Aldik Artificial Flowers, Aldik Home provides the most discriminating retail and wholesale customers with the same high-quality silk floral products and exemplary customer service that made Aldik wholesale silk flowers an industry standard. You've never seen the most amazing Christmas display until you've visited Aldik Home's Van Nuys Showroom during the merriest season of the year. Thousands of ornaments, luxurious ribbon, a plethora of LED lights and the best artificial Christmas trees in the country await your visit. It’s time to check out the best Christmas in Los Angeles. You’re invited to wander through a winter wonderland featuring life-sized displays and more than 50 fully-decorated trees. Marvel at the incredible selection of unique glass ornaments, revel in the soft glow of thousands of LED lights in the Light Room, or lose yourself in Aldik Home’s immersive artificial tree lot with more than 60 of the most realistic Christmas trees in the country. "One visit is all it takes to see why Aldik Home's artificial Christmas trees are the highest quality artificial Christmas trees in the country, vastly better than those offered at online retailers." One visit is all it takes to see why Aldik Home's artificial Christmas trees are the highest quality artificial Christmas trees in the country, vastly better than those offered at online retailers. We are especially proud of our growing Neuman Tree collection. Featuring stronger branches, profiles that were designed specifically for decorating, incredibly realistic designs, and the Brilliant Lighting System, there simply is no better artificial Christmas tree than a Neuman Tree. For the best selection of Neuman Trees, as well as several exclusives, visit Aldik Home's gorgeous tree lot during the holidays. From the incredible selection to the jaw-dropping displays, this Winter Wonderland is a feast for the senses that gets re-invented every year. You owe it to yourself to visit. When it comes to Christmas in Los Angeles, there’s no place like Aldik Home.